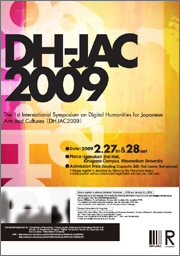 DH-JAC2009　You can participate in the Symposium without advanced registration ... free! The advanced registration for the 1st International Symposium on Digital Humanities for Japanese Arts and Cultures was over, but we still have seats available. Thus, you can participate in the Symposium without advanced registration … free!, thanks to many organizations’supports. Please join us on this important occassion. Geography has experienced two revolutions in information technology since World War II; the Quantitative Revolution and GIS (Geographical Information Systems) Revolution. The former has introduced a positivist epistemological framework in Human Geography as well as statistical and mathematical methods. The latter has facilitated the dispersion of GIS as a tool for handling digital maps and given rise to GIScience as a new interdisciplinary research field. This paper explores the present situation and future prospects of Digital Humanities based on the experience of Geography and GIScience. Our research on digital archiving of human body motion and its application will be presented. This is one of the case studies of Digital Humanities research in art and culture field. Human body motion data are obtained by using an optical type motion capture system. Motion data are used for not only archiving but also several data analysis research. Analyses include identification of dance motions and/or dancers, and extraction of characteristic parts from the sequence of dance motion. Furthermore, motion data retrieval based on the similarity of body motion itself, and extracting relationships between 'Kansei' (emotional) factors which and body motions will be presented. Topics of creation of computer graphics animations and a trial of making a dance collaboration system in virtual reality environment will also be shown. The World Wide Web keeps on developing as an infrastructure for sharing and exchanging knowledge among not only academe but also all kind of social activities. A new trend called Web 2.0 reduces the gap between experts and non-experts, and leads us to engage in participative and collaborative creation around the world. Semantic Web is a key concept for the next stage after Web 2.0, which interconnects various artifacts and cultural heritages to implement human/machine intelligible knowledge bases on the Web. This development of the Web that aims at the integration of human wisdom with the digital technology was already anticipated at its birth. In this presentation, the future vision of Digital Humanities will be discussed by overviewing the history of the Web evolution. Since 1999, funded by the Ministry of Education, Culture, Sports, Science and Technology, I had created highest-quality digital image archives of murals in Pompei, Italy. At the same time, I produced a video, computer graphic reconstruction of Casa di Jiulio Polibio. These research projects let me realize that digitalized information has rather crucial vulnerability in its record preservation aspect, which led to my 2006 publication of Pompei (Regiones VI-VII) -Insula Occidentalis. I will elucidate why I made this publication, a catalogue of murals in Pompei, by comparing analogue and digital information.